National security adviser Chung Eui-yong advised North Korean leader Kim Jong-un to quit smoking, the Asahi Shimbun reported on Sunday. 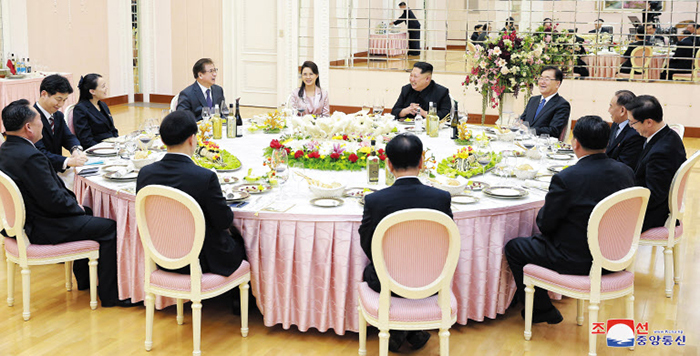 This episode happened when Kim had dinner with the South Korean envoy in Pyongyang on March 5, the daily quoted a source as saying. "How about stopping smoking? It's bad to your health," Chung said. Kim Yong-chol, the head of North Korea's United Front Department, who was on hand, froze in terror since for a North Korean any kind of advice or admonition of the supreme leader is considered blasphemy. But Kim's wife Ri Sol-ju looked amused, clapped her hands and said, "I always ask him to quit smoking. But he won't listen to me." "The atmosphere that could have become awkward softened," the daily added. Kim reportedly smokes wherever he is, often giving orders to officials with a lit cigarette in his hand. He smokes indoors even when he visits hospitals, schools and kindergartens. An ashtray is ready wherever he sits. Former leader Kim Jong-il also was a heavy smoker, but state media edited or deleted images of him smoking, a government official here said. "But Kim Jong-un doesn't seem to mind."